I use chai tea bags to make chai lattes. They're a little too strong for me to have just with water. Anyways, this chai tea is infused with vanilla which is perfect for a nice, creamy chai latte. 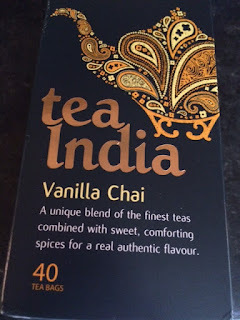 Anyways, I saw these in Tesco and decided they'd be perfect to make chai lattes with. I heat up my skimmed milk in my Nespresso milk frother and pour it into my mug. Then I leave the chai tea bag in there and infuse it for around 5 minutes. Et voila! Perfect chai latte. Well these tea bags worked really well and the vanilla added a nice rich element to the drink as well as it being spicy as I'd expect. The chai spices are very pronounced in this drink which I love!